The "Trail of Tears" refers to the forced relocation in 1838 of approximately 16,000 Cherokee Indians to the Western United States, which resulted in the deaths of an estimated 4,000 Cherokees. 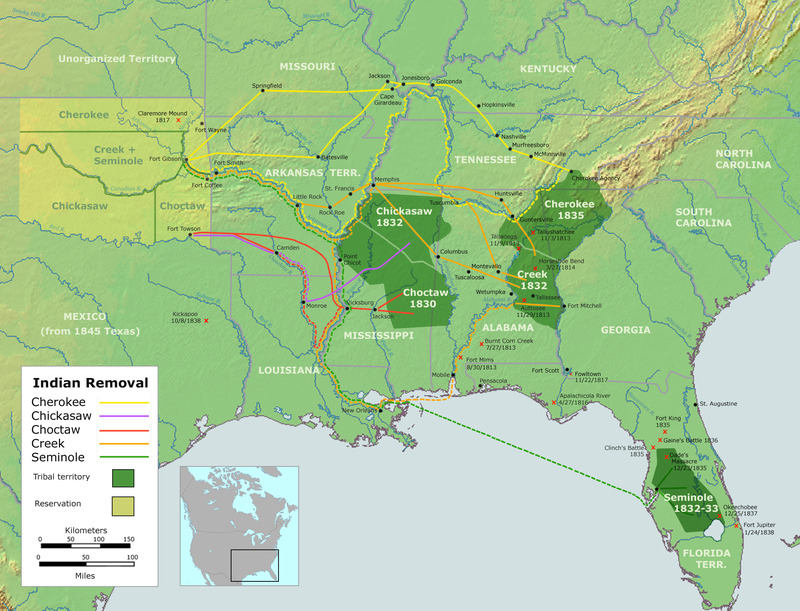 There were several routes used during the unconscionable journey, but the trail had its roots in a series of Indian removal acts that continued to push the indigenous Americans westward. 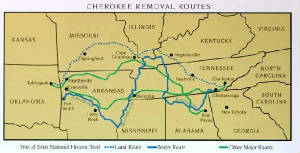 See also Trail of Tears Map of Routes and Indian Removal and Trail of Tears. 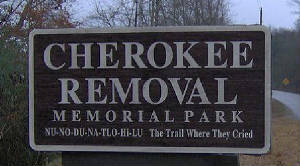 The Trail of Tears was the result of the enforcement of the 1835 Treaty of New Echota, an agreement signed under the provisions of the Indian Removal Act of 1830, which exchanged Native American land in the East for lands west of the Mississippi River, but which was never accepted by the elected tribal leadership or a majority of the Cherokee people. Tensions between the State of Georgia and the Cherokee Nation were brought to a crisis by the discovery of gold near Dahlonega, Georgia, in 1829, resulting in the Georgia Gold Rush, the second gold rush in U.S. history. Gold speculators began encroaching on Cherokee lands, and pressure began to mount on the Georgia government to fulfill the promises of the Compact of 1802. When Georgia moved to extend state laws over the Cherokee lands in 1830, the matter went to the U.S. Supreme Court. In Cherokee Nation v. Georgia (1831), the Marshall court ruled that the Cherokee Nation was not a sovereign and independent nation, and therefore refused to hear the case. However, in Worcester v. Georgia (1832), the Court ruled that Georgia could not impose laws in Cherokee territory, since only the national government — not state governments — had authority in Indian affairs. President Andrew Jackson had no desire to use the power of the national government to protect the Cherokees from Georgia, since he was already entangled with states’ rights issues in what became known as the nullification crisis. With the Indian Removal Act of 1830, the U.S. Congress had given Jackson authority to negotiate removal treaties, exchanging Indian land in the East for land west of the Mississippi River. Jackson used the dispute with Georgia to put pressure on the Cherokees to sign a removal treaty. The treaty, which passed Congress by a single vote, was signed into law by President Andrew Jackson, and imposed by his successor President Martin Van Buren who allowed Georgia, Tennessee, North Carolina, and Alabama an armed force of 7,000 made up of militia, regular army, and volunteers under General Winfield Scott to round up some 13,000 Cherokees into concentration camps at the U.S. Indian Agency near Cleveland, Tennessee, before being sent to the West. Most of the deaths occurred from disease, starvation and cold in these camps. Their homes were burned and their property destroyed and plundered. Farms belonging to the Cherokee Indians for generations were won by white settlers in a lottery. After the initial roundup, the U.S. military still oversaw the emigration until they met the forced destination. 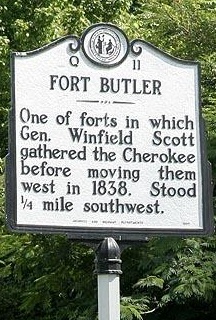 Private John G. Burnett later wrote, "Future generations will read and condemn the act and I do hope posterity will remember that private soldiers like myself, and like the four Cherokees who were forced by General Scott to shoot an Indian Chief and his children, had to execute the orders of our superiors. We had no choice in the matter." "Long time we travel on way to new land. People feel bad when they leave old nation. Women cry and make sad wails. Children cry and many men cry, and all look sad like when friends die, but they say nothing and just put heads down and keep on go towards West. Many days pass and people die very much. We bury close by Trail." The Cherokee remember the forced removal as Nunahi-Duna-Dlo-Hilu-I, which means the Trail Where They Cried. While the Cherokee Removal was forced on the majority, Indian Agent William Holland Thomas (a self-taught lawyer, Cherokee chief, and North Carolina state senator) successfully lobbied Washington for a number of Cherokee to remain in Western North Carolina. The Cherokee that avoided the death march are the ancestors of the present-day Eastern Band of Cherokee Indian Nation. The United States would later justify its Indian Removal as Manifest Destiny, a term that had been coined out of both greed and paranoia. See also Oklahoma Territory and Indian Territory. The Trail Of Tears: Cherokee Legacy also includes narrations of famed celebrities Crystal Gayle, Johnt Buttrum, Governor Douglas Wilder, and Steven R. Heape. Includes numerous Cherokee Nation members which add authenticity to the production… A welcome DVD addition to personal, school, and community library Native American history collections. The Trail Of Tears: Cherokee Legacy is strongly recommended for its informative and tactful presentation of such a tragic and controversial historical occurrence in 19th century American history. Tsali, Cherokee Hero and Legend: "I will die so that my people may live." Their strategies ranged from military action to diplomacy, spirituality, or even legal and political means. The stories of these individual leaders span four hundred years; collectively, they give a portrait of an oft-overlooked yet crucial side of American history, and carry the highest recommendation for public library as well as home DVD collections. Special features include behind-the-scenes footage, a thirty-minute preview film, materials for educators and librarians, four ReelNative films of Native Americans sharing their personal stories, and three Native Now films about modern-day issues facing Native Americans. 7 hours. "Viewers will be amazed." "If you're keeping score, this program ranks among the best TV documentaries ever made." and "Reminds us that true glory lies in the honest histories of people, not the manipulated histories of governments. This is the stuff they kept from us." --Clif Garboden, The Boston Phoenix. As he and other Cherokee leaders grappled with the issue of moving, the land-hungry Georgia legislators, with the aid of Jackson, succeeded in ousting the Cherokee from their land, forcing them to make the arduous journey West on the infamous "Trail of Tears." Mary B. Davis, Museum of American Indian Lib., New York, Copyright 1988 Reed Business Information, Inc.
Long regarded by whites as one of the 'civilized tribes', the Cherokees had their own constitution (modeled after that of the United States), elected officials, and legal system. Once re-settled, they attempted to reestablish these institutions and continued their long struggle for self-government under their own laws—an idea that met with bitter opposition from frontier politicians, settlers, ranchers, and business leaders. After an extremely divisive fight within their own nation during the Civil War, Cherokees faced internal political conflicts as well as the destructive impact of an influx of new settlers and the expansion of the railroad. McLoughlin conveys its history to the year 1880, when the nation's fight for the right to govern itself ended in defeat at the hands of Congress. Tireless research and the author's gift of vision and words produce a magnificently readable narrative of the American Indian Removals. It is very balanced with no point of view overlooked. Include many surprising appearances and plenty of twists which will make you laugh out loud and break your heart. A very human book and an absolute must-read for anyone who wants to learn history through the eyes and ears (and hearts) of those that experienced it. You won't be able to put it down.